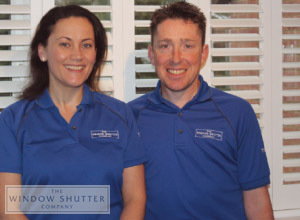 The Window Shutter Company was founded in 2012 is owned and jointly run by Tim and Liz Sawyers, in Haywards Heath, West Sussex. We specialise in the supply and installation of interior plantation shutters and do not supply blinds. We have offices at the Basepoint Business Centre on Bridge Road, Haywards Heath, but please be aware that currently we don’t have a showroom facility open to the public. We always bring product and colour samples with us, along with a huge library of images, to your free home design visit so that you can make an informed choice from the comfort of your own home. You will only ever deal with Tim or Liz throughout the whole process, so you have the continuity of dealing with one dedicated team throughout. Tim’s experience in the shutter industry exceeds 12 years, having previously worked for the main trade supplier in Europe. At installation stage, we work with a team of qualified joiners who have many years experience of installing shutters. Tim will also always be there at the installation so you know that the person who surveyed, fully understands shutters and is there to install them for you too. We cover the South East of England, including West Sussex, East Sussex, Surrey, Kent, Hampshire and parts of London and Essex. The British Blind and Shutter Association (BBSA) is the only national trade association for the shutter industry and we are and we are proud to continue to be an accredited member of this organisation. We are proud to be members of the Guild of Master Craftsmen and to have received their coveted Certificate of Quality and Service. We are also members of Checkatrade. From our page you can see all of our outstanding reviews from satisfied customers over the years. We supply and install the highest quality products on the market. Our extensive years of experience and technical knowledge sets us apart from many other companies that might sell this range – which our Checkatrade rating and incredibly positive client testimonials confirm. We offer a manufacturer supported five year warranty and through our after-care service, are here to assist you in the unlikely event that you have any issue with your shutters after installation. We are fully insured and verification of this can also be found on Checkatrade & The Guild of Master Craftsmen. Our years of experience, prior to starting The Window Shutter Company, working for the main trade supplier in Europe, has given us a level of knowledge and understanding of the shutter market to rival any other companies. Exceptional service from initial contact to installation… and beyond! We want to make your decision as easy as possible. Our experience and knowledge both in this market and of customer service will give you reassurance and peace of mind when choosing your shutters. If at any point you need to speak to us throughout the process, you can call or email us and you know you are dealing with a family run business who value your custom and will go out of their way to assist and help you. No call centres to deal with!